Tuesday NBA betting lines, trends: Will 'fired coach angle' help Bulls cover at Pacers? The betting theory is simple: Bet on a team that just fired their head coach after their last game as players go harder for a new coach calling the shots. 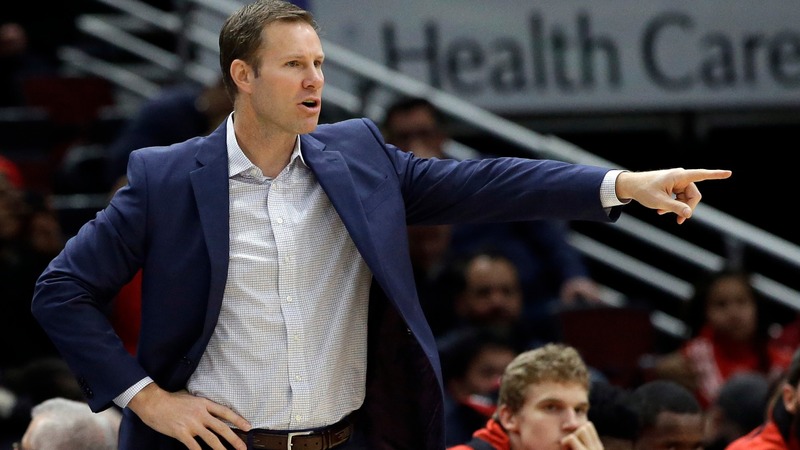 The Bulls announced the firing of Fred Hoiberg on Monday, ending his tenure during his fourth season as the team's head coach and cashing betting tickets that he'd be the next NBA coach fired. Can Hoiberg's departure help the Bulls cover 8.5 points on the road at the Pacers on Tuesday? The ATS betting theory is simple: Bet on a team that just fired their head coach after their last game as players go harder for a new coach calling the shots. The Cavaliers covered their first game after firing Ty Lue earlier this season, beating the Hawks outright 136-114 on Oct. 30. Switching sports, the Browns didn't cover after firing Hue Jackson but NFL teams are 67-65-2 ATS after firing a [coach in-season](https://twitter.com/johnewing/status/1070021228205879297) since 2003. NHL teams are 2-2 SU after their coaches were fired this season. So maybe the theory doesn't have that much merit but the Bulls do have Lauri Markkanen (elbow) back and are 9-4 ATS as single-digit underdogs this season. __MORE:__ [Bulls fans and fantasy owners will need patience as Lauri Markkanen returns](https://www.betchicago.com/lauri-markkanen-return-bulls-fansfantasy-owners-patience) The Bulls covered against the Pacers earlier this season (107-105 loss/UNDER) and is facing Indiana without Victor Oladipo in its first game back from a road trip. The Bulls are in a favorable spot on Tuesday (6:05 p.m., NBCSCH) even if the betting trends don't back it up. ### Bulls at Pacers odds, lines, trends 6:05 p.m. __Point spread:__ Pacers -8.5 __Total:__ 209.5 __Moneyline:__ Bulls +300, Pacers -400 __Betting trends:__ Bulls are 1-6 ATS in their last seven vs. Eastern Conference. Bulls are 8-21 ATS in their last 29 road games dating back to last season. Bulls are 2-8 ATS in the last 10 meetings in Indiana. UNDER is 8-2 in Bulls last 10 vs. a team with a winning straight up record. __MORE:__ [Odds to win 2018-19 NBA championship](https://www.betchicago.com/nba-odds-championship-2018-19-raptors-rockets) ## Tuesday NBA betting lines, odds for December 4 *Odds courtesy of Westgate LV SuperBook; All times Central ### Magic at Heat odds, lines, trends 6:35 p.m. __Point spread:__ Heat -2.5 __Total:__ 208 __Moneyline:__ Magic +125, Heat -145 __Betting trend:__ UNDER is 10-1 in Orlando's last 11 road games vs. a team with a losing home record. __PLAY:__ [Daily NBA Pick 5 contest ATS](https://betchicago.chalkline.com/games/nba-pick-5) for a chance to win a BetChicago prize pack ### Trail Blazers at Mavericks odds, lines, trends 7:35 p.m. __Point spread:__ Mavs -1 __Total:__ 218.5 __Moneyline:__ Blazers -105, Mavs -115 __Betting trend:__ Blazers are [0-7 ATS in their last seven games](https://theathletic.com/691726/2018/12/03/as-trail-blazers-scuffle-damian-lillard-vows-we-will-come-out-of-it/) overall. ### Kings at Suns odds, lines, trends 8:05 p.m. __Point spread:__ Kings -6 __Total:__ 223.5 __Moneyline:__ Kings -240, Suns +190 __Betting trend:__ OVER is 10-1 in Kings' last 11 road games. ### Spurs at Jazz odds, lines, trends 8:05 p.m. __Point spread:__ Jazz -8.5 __Total:__ 215 __Moneyline:__ Spurs +300, Jazz -400 __Betting trend:__ Spurs are [0-7 ATS in their last seven games](https://www.poundingtherock.com/2018/12/4/18121539/san-antonio-spurs-fundamentally-flawed) vs. a team with a losing straight up record.